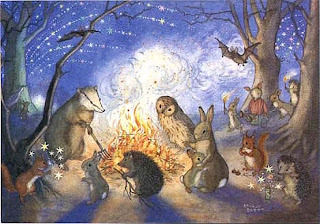 To visit my online store featuring a large variety of great products, gifts, and collectibles featuring my own whimsical animal art, please go to Adele's Cute Animal Art Shop. A prolific artist and author of more than two dozen children's books, Racey Helps was also one of the Medici Society's most popular postcard artists. 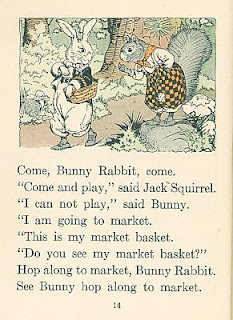 Like Beatrix Potter, Helps began his career by illustrating his own stories and mailing them off to a child - in this case, his own daughter, living away from home in the safer countryside during WWII. Help's work was discovered by a publisher while he worked as a hairdresser with his wife. Although he died in 1971, his descendants in Great Britain maintain a fabulous website devoted to Helps and his work, with an extensive biography, bibliography, and a ton of gorgeous reproductions of his illustrations. The URL is: http://www.raceyhelps.co.uk Enjoy! I've chosen this work called "The Astonished Angler" not only because it's a prime example of cute or dressed animal art, but from an artistic point of view, it's a smashing success - beautifully composed, with flowing lines all circling about the central point of action; employs a very effective color scheme, using primarily the three analogous colors of blue, green, and yellow; has accurate yet simplified botanical detail; and provides a smile just viewing it. What more could a picture offer? Would you like to see my own whimsical animal art? 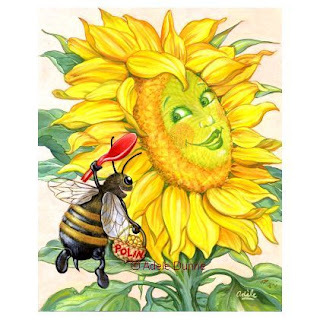 Please visit my online store, Adele's Cute Animal Art Shop, featuring a large variety of great products, gifts, and collectibles featuring my own cute animal illustrations. 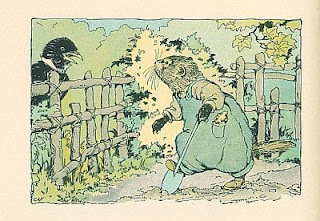 There's two camps, or distinct styles, in animal character illustration. This first is naturalistic, like Beatrix Potter's. You may be aware that her first artistic efforts were in scientific illustration - her renderings of mushrooms, bugs, flowers, etc. are superb. When she began to illustrate her books, she never compromised her facility for naturalism. A frog may have been wearing a waistcoat, but he always remained an anatomically correct frog! 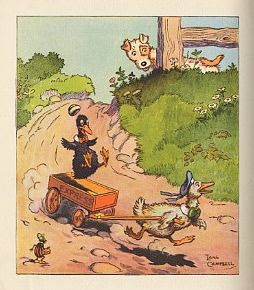 Lansing “Lang” Campbell was a 20th c. American illustrator and cartoonist best known for illustrating the Howard Garis cartoon series "Uncle Wiggily’s Adventures" (started 1910), later to become the basis for several dozen books featuring the beloved character. 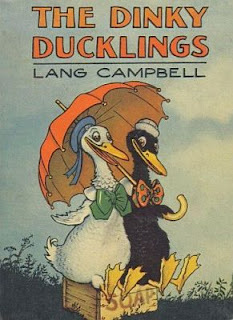 During the 1930's, Campbell also created a few strips and books of his own, including "Piggy Pigtail", "Paddy the Pup", "Dippy Doodlebug", "Bizzy Izzy Humbug", "The Dinky Ducklings", "Duck and Applesauce", "Dicky Bird’s Diary," "Merry Murphy" and more. After an active career in New York City, he retired to Boothbay Harbor, ME about 1950, where he spent the rest of his life. Exact dates of birth and death unkown. 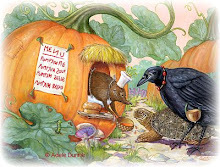 To visit my online store featuring a large variety of great products, gifts, and collectibles featuring all my whimsical animal art, please go to Adele's Cute Animal Art Shop. Since I'm always scouting around for examples of cute animal illustrations, I was really excited to come across an old 1927 book at my local thrift store called "Pine Tree Playmates." 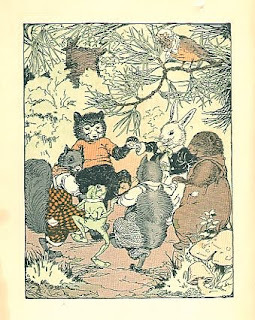 A beginner reader, it was written by children's author Mary Francis Blaisdell and illustrated by an artist I'd never heard of, Clara Atwood Fitts. What fun to find someone new! 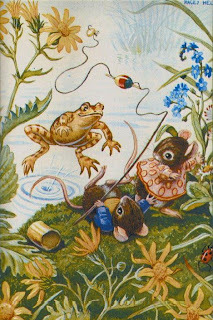 Since the illustrations were so beautifully done - by someone who was obviously well-practiced in animal character illustration - I tried to find out more about her. There's not much. She was born in Worcester, MA in 1874, attended the Boston Museum School, was a member of the prestigious Copley Society, and lived and worked primarily in NH. A quick search of Amazon Books shows considerable artistic versatility, with children's, religious, and classics to her credit. Her date of death is unknown. Above are a few examples of her work. They are extremely charming, beautifully drawn, well composed, and cute, cute, cute! Don't you agree?